TONY - It's easy for Jim Leonhard to stay grounded. When he's standing on this familiar football field, surrounded by this familiar countryside, it's impossible for Leonhard to forget where he came from. He may now make his living in New York - pretty much the polar opposite of this setting - but he's never far from Tony, Wis. This right here is Jim Leonhard's roots. He's Tony through and through. It shows every time he plays. And it shows even more in the grin on his face during a midday break from his annual hometown football camp. "I've been very fortunate," Leonhard said. "I caught a lot of breaks along the way and have had some tremendous experiences in my life. Any time you come home, you think about where you came from and how much support that you've had. It is kind of humbling every time I come back." It was about seven years ago that Leonhard put this little town of 100-some people on the map with his Hollywood-like ascension to unlikely football stardom. Using that small-town fight and work ethic that he learned in Tony and right here on the Flambeau High School football field, he went from obscure walk-on to cult hero all-American at the University of Wisconsin. Then he went from undrafted free agent to NFL starter. Seven years later he's back home as an established NFL player bearing the label of key offseason addition for the New York Jets. "You have to have that attitude," Leonhard said. "Those are the only guys that stick around. It's great that I learned that at a young age. That's one of the biggest things I learned from growing up here. It's obviously been very beneficial to my career." It's late June and Leonhard is back on the field where he once terrorized the Lakeland Conference. For the second consecutive summer, he's hosting a football camp at Flambeau High School. Seventy or so kids are in attendance. Joining Leonhard is Seattle Seahawks fullback and Gilman native Owen Schmitt, as well as Leonhard's college roommate, former Badgers tight end Joel Nellis. In future years, Leonhard hopes to have even more coaches with NFL and college experience at the camp. Clearly, the camp is a great experience for the collection of kids from all over the area, who get to rub elbows with a pair of NFL players. "You can see it in their eyes, they're really excited," Leonhard said. "They're not going to show it. They're high school kids. They're too cool to show it. But it's fun." As Leonhard points out, the camp is just as important to the coaches, who can pick up valuable lessons and new ideas. After each session, Leonhard watches film and talks shop with them. There also will be a barbeque filled with plenty of chalk talk and chances to bounce ideas off each other. It's also pretty clear that the resident NFL safety in the group gets a lot out of it too. "It's perfect," Leonhard said. "Just to give back to the community and all these fans and all these kids. When I was in high school, there was nothing like this. To have a couple NFL guys come back and college football players - the majority of even local coaches I have working it played somewhere in college - it's just a great opportunity to have good coaching and just get out there and play football." Thursday Leonhard will hold an autograph signing from 6 to 8 p.m. at Flambeau High School. Fans will pay $5 a pop for his signature and all that money will go to Tony Little League. 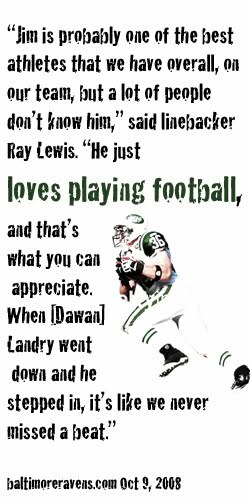 It's another chance for him to give back to the football-crazy town that he's slowly converting into Jets territory. After spending most of his career proving over and over again that the 5-foot-8 guy belongs, Leonhard enters this season in something of a new position. He's putting on the third different uniform of his five-year NFL career but he does so as a known commodity. He was able to parlay a breakout season with the Baltimore Ravens - in which he made 13 starts, had 85 tackles, a sack and an interception - into a free agent deal with the Jets. In New York, he's reunited with Rex Ryan, the former Ravens defensive coordinator and first-year Jets coach. For the first time in Leonhard's pro career, he enters training camp as a presumptive starter. "It's really the first time at that level that I've kind of had that seal of approval from a head coach going into the season," Leonhard said. "That gives you a lot of confidence. It also ups your responsibility and just your leadership on the team. I'm taking that as a challenge going into the year." But don't expect Leonhard to lose any of that small town grit in the Big Apple. He doesn't know any other way.